I just wanted to let let everyone know how blessed I really am. When I met Jerri, ten plus years ago, I knew she was a very special women (after all she stayed with me), But its not till you go through an experience like this that you realize who she really is. I tell you the truth, I have the most amazing wife one could ever have. She was unbelievably strong for her family (the girls and I), during the past week and a half, even though she was hurting so bad, her arms ached with emptiness. Even as I write this, she is writing thank you cards to everyone that helped and supported us in and through this time. She is reading through notes of the past couple of weeks to remember everyone who supported us, which brings back the ache of emptiness. She doesn't know that I am posting this (she probably wouldn't let me ), but I thought every one should know. I love you Babe! Now that I turned in my man card, I want to share this puzzle with you. 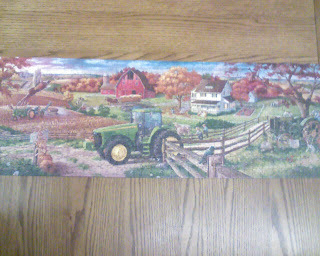 This is a 500 piece jigsaw puzzle we got Kylei for Christmas. We were to put it together as a family, frame it, and hang it above Baby Brothers crib. Well, we did put it together as a family and its 12"x36" and looks great. However, it was a reminder of the crib we don't have to hang it above, so I thought what better place to hang it than on this blog for everyone to enjoy. There is not a moment that goes by during the day that we are not reminded of Baby Brother. Even when I think of how close Jerri and I have become, I think of him and thank God for him. If it wasn't for Baby Todd we never would have spent so much time together or even tried to. I praise God of he is Good! I would like if whoever reads this to comment to Jerri. I know she would like it. Thanks! I have been reading your blogs for the past year and it amazes me the strength that you have. I know that the young girl that used to come to my house for sleepovers and eat baby food for snacks has blossomed into such a beautiful woman of God. I cry with each blog because I know that under all the strength there is still that soft mother that longs to hold her baby. Your strength shows through the conversations you have with your girls and their replies to you. I agree with the statement that this was an illness that only Jesus could fix. We may not know the reason, but someday we will. You have become like a best friend to me throughout the past few years and especially through the past week and a half. I appreciate your willingness to hang out with me and share your heart...I have learned so much about you and about life in general throughout the past week or so. I have been so inspired by your strength throughout the life and death of Baby Todd but also through your willingness to admit that at the same time you are broken and overwhelmingly sad. I have also been inspired by your thrifty ways and your eagerness to save money and get good deals wherever possible...it has helped me to consider the value of money just a little more. I am so thankful for you and Dustin and the girls and for the time I've had to spend with you over my break. Thanks for all you do...keep it up!! I love you!! P.S.-- Dustin, I wanted to let you know that I have been just as inspired by your faith and strength throughout the past several weeks as well...I know this was supposed to be all about Jerri, but I thought I'd just throw in that I'm extremely thankful for you as well! Love ya! Jerri, I will be honest I have personally not taken too much time to read your blog's, but Anne has kept me well informed on what has happened and what things are going on. It is amazing to hear/read your words and see how you and Dusty give every oppurtunity to bring honor, glory, and praise to our Lord and Savior Jesus Christ. It just blows my mind how you guys do it. Everyone is hurting for you guys and you end up bringing more encouragement to us than we can give to you. What more can I say? You, Jerri do not know how many times you have made my wife cry from your wonderful words and have encouraged her for the day. Dusty, Your words have been awesome and inspiring. The way you bring praise to Christ every time you write is just impressive. I can see it has brought your whole family closer together. Just maybe God has brought this in your life for the very purpose of showing you how important your family is. Just from your writing it has reminded me how short our life is here on this earth and that we need to make the most of every oppurtunity to serve Christ now. You have displayed the beauty of Christ in the midst of immense pain. I am amazed and so encouraged by how you are standing strong and holding tightly to the hand of Jesus (even as it feels like everything is so broken). You are a blessing to me--thank you for being so open and allowing us to walk with you on this journey. Continue holding tightly to the hand of the One who is holding tightly to Todd. Know that His healing touch will sustain you and give you what you need in the days to come. Both of you are incredible parents--what a gift it is to see your love for each other & your children. I am praying for you each and every day. My heart aches for you and your family. You are quite a Godly woman Jeri and I truely admire you for your strength in Christ. To read all that has been wrote you can feel the Presence of God in this. You have showed strength that only God could bring. As Jared wrote, you have poured out more encouragement then we can provide for you. Todd is smiling at Jesus saying "That's my Mom isn't she the greatest" May you continue to comforted by Him. You have been such an amazing man of God through all of this. For me personally there are many days that your words have boosted my faith more then I thought possible. May you continue to show people how "a real man" one that loves Jesus, and his wife can stand strong by allowing God to carry you through ALL. Hope to see you in church tommorrow and give you a great big brother in Christ hug. Dusty and Jerri - our love and admiration to both of you. Your faith and courage has truly been a great example and an encouraging testimony to many. Our thoughts and prayers are with you. First, I echo the others in being priveleged to have known you since you were a little girl. Second, I remain amazed at how God's faith can strengthen and support us even when we don't get what we want, and surely He didn't act in the way we wished, but did His will-as always. Our faith is stronger because you shared your walk with us. You are truly amazing, but you have always been. It is really nothing new to me. To have suffered this great loss and come out of it supportive, taking care of others, and with your marriage stronger for it is another positive testimony for us all. I don't know you except through your blog, but your "man" faith has inspired so many men to turn toward God and their families instead of away. You know that as a Christian role model, you have affected more people than you can ever know by supporting your wife through this and not turning your back on her needs. I have used your blogs as Sunday School lessons, showing old and young alike how faith can get us through the toughest times. And this is the toughest time-losing a child. To you both...prayers...they will continue for all time. I can't wait to see you and hug you...let me know when you are ready. Love always...and thanks for allowing us to be part of Baby Brother's Journey Home. first I have to say that you didn't turn in you "man card". Only a real man can bless his wife with such love and tenderness. Thanks for your example. You truly are woman of noble character. Dustin is a very lucky man to have you by his side! Jerri, my name is Randi Wishard and I just recently learned of the blog, and I just wanted to tell you that you are truely an amazing woman and what you are doing with the blog is helping so many people in so many different ways. I look forward to meeting you. I will continue to pray for your family. God Bless! Ok...so obviously I haven't read the blog in a little while..and not because I stopped caring, but before it was the best way to communicate with you guys and now I have you in person, so I just talk to you...However, for some reason I just felt really drawn to it today and as I have been reading the past couple blogs I want you both to know that Mike and I speak often of the change we've seen in your relationship (not because we thought it was bad before) but you just seem so much closer not only to each other, but to Christ. I first want to thank both of you for the friends you are. ...and Dustin I will never forget the night we came to tell you guys we were engaged and actually pranked you into helping us with a fake argument..although it is very funny, what is the greatest to us is that you took it very seriously in trying to help. I thank God for relationship you have with Mike and us as a couple. I have had many long talks with you and spent a lot of time at your house (with and without you guys even being there :) and I'm so glad that we can do that. You've given me some really good advice and if nothing else you listened. I will never forget your comment the day of the funeral to me when you said.."I am a mother and my first priority is to get my family through this..then if there is time for me then I will worry about myself" I think that just shows a lot about your strength and character! I knew you were special too when I met you a little over 10 years ago my freshman year of college. I remember staying up half the night chatting and taking birthday trips to Ocean City. We had so many fun times together. I wish that I could be closer to you now to go through this with you. I know we only keep in touch with random cards throughout the year but through this time you are always in my heart. There is not a day that goes by now that I don't think of your family. You were my best friend at school and Dustin has found himself an amazing woman and God has also blessed you with a Godly husband. You make me realize how much I have to be thankful for. I try to take time every day to smile at my girls and just relish the joy they bring me. I love you and miss you. Thanks for being you and sharing from you heart as you go through this...you are such an inspiration. Dustin, keep taking such good care of my girl!